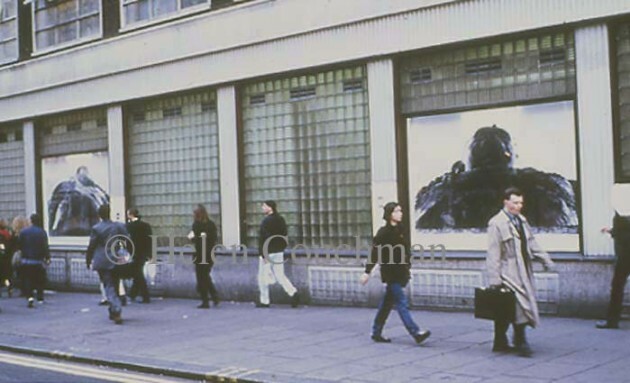 “Two giant photo images stand at the entrance to Central St. Martins, Charing Cross Road. Taken directly from statues on the steps of the National Gallery (Trafalgar Square), these images constitute a change of guard. Preface questions the criteria of admittance to and the (im)possibility of cross over between institutions”. One thousand postcards were sent carrying the preface page of a book Forty London Statues and Monuments, by Tancred Borenus, first published in 1929. The two sentinels, (the portraits taken of robust bronze statues of two generals standing outside the National Gallery in Trafalgar Square), were pasted just behind two large glass windows at the front of the famous Central Saint Martins School of Art, facing a busy London street. The inkjet posters were constructed in large laminated strips and each lit by a single fluorescent light. Both postcards and advertising posters are familiar objects constructing a situation which acknowledges their promotional qualities. However, both mediums have been edited to consider the particularity of the site. 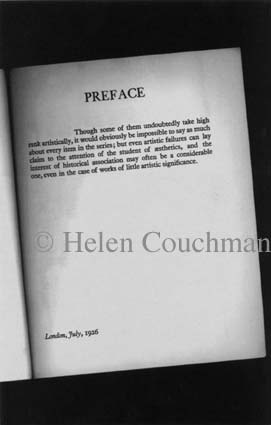 Preface considers interaction between various aspects of the art world and London’s cultural inheritance. Echoes of a joint cultural, political, and economic relationship between the sites can be found in these “monumental” objects.